Well....this sweet little girl turned 4 almost 2 weeks ago. 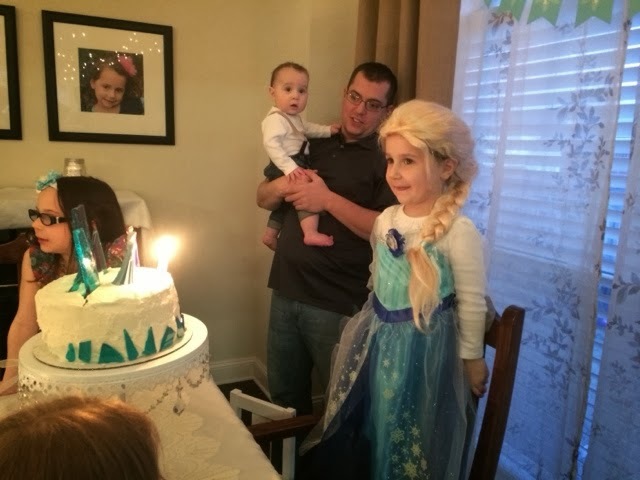 And to celebrate....her only request was a Frozen party. 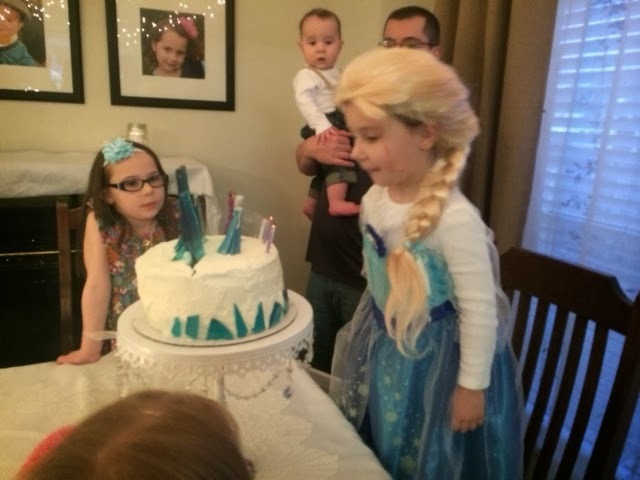 Really....I think she just wanted an Elsa party...because, you know...she has special "ice" powers and all. We watched the movie in early December....and soon after decided on her party theme. My mind began racing with all of these fun ideas (along with ideas from Pinterest). And with it being right in the middle of the Christmas season...it really helped out with the decor. I had already decided that I wanted to add and change up our Christmas decor from white and red to white/ivory/silver/burlap and was slowly adding a few new things here and there. 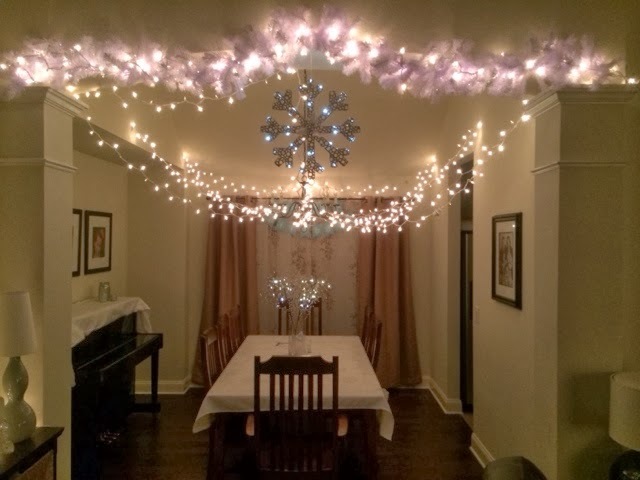 So almost all of the decor for this party will be used again next year at Christmastime...and even more exciting- is that most everything was bought on clearance after Christmas. It was a win-win. We only had family as guests, but we really wanted to make this party special for Grace. She's sort of gotten the short end of the stick when it comes to parties....and is usually so content with whatever (this is always, not just for parties)...so we just wanted something special that was for her. ***Quite a few of these ideas were not my own...and where they are not my own, I will specify and give credit where it's due. Most ideas were taken from Bubbly Nature Creations. Pleave a comment with any questions! I got the white pre-lit Christmas trees at Wal-Mart. 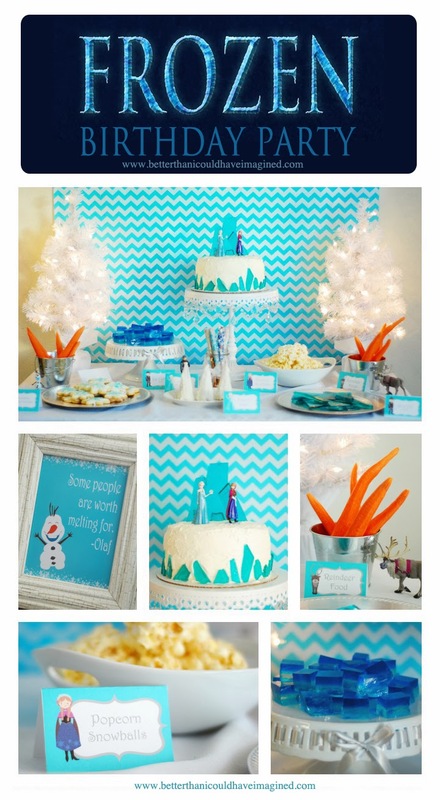 This table was so fun and full of 'frozen' things! I got the idea for this cake from here. Hers looks a lot nicer and is an ice cream cake. I took the easy way out and just made a boxed cake and added ice cream to the plate. I found the cute cake stand for a pretty good price at Home Goods. I wasn't really looking for it when I went, but when I saw it, I knew it would go perfectly. Love the 'crystals'...and that this is a taller stand. I made this "ICE" rock candy. This also went on the cake and on a separate platter. (this silver platter is plastic from Hobby Lobby for $1.99) and I love it. This rock candy idea came from here. The girls actually helped me make the popcorn balls and sugar cookies. I wanted them to be a part of making the party, too. 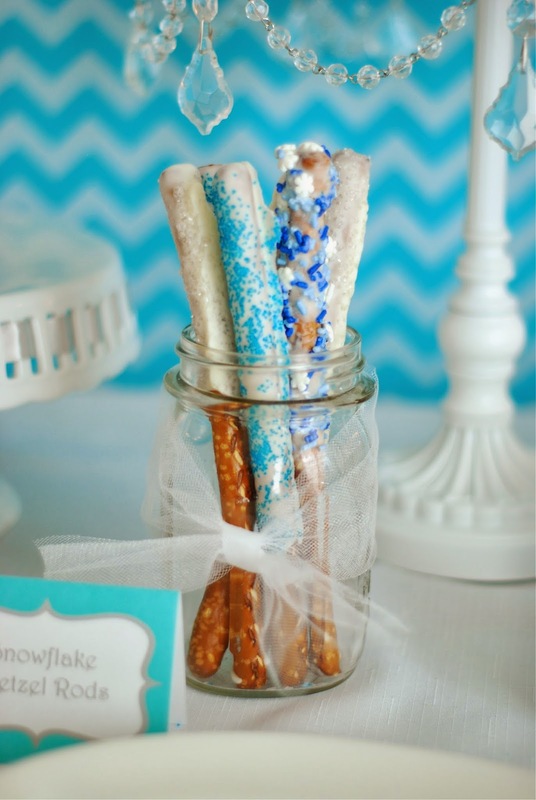 We went to a Mommy and Me Christmas tea back in December, and they had these almond bark pretzel rods there. Grace ate 3 or 4, so I knew I wanted to make them for her party. And, of course, reindeer food (idea also from here). Jello ICE cubes. Idea also from here. Frozen Trees. Icing on Sugar cones with sprinkles. Ideas also from here. My plan was to make some blue raspberry lemonade to drink, but yeh- that never happened. So the only thing I offered was water. Then I made these water bottle labels, printed on card stock, and attached them to the bottles with packing tape. 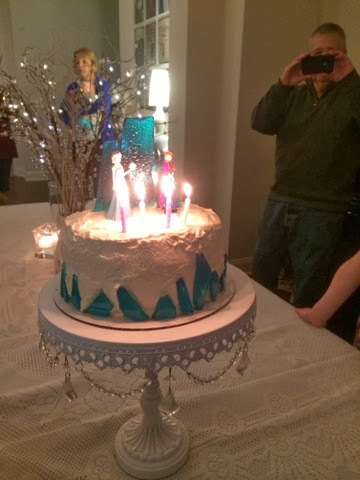 The dining room was supposed to be Elsa's Ice Castle. Absolutely love love how this turned out. So whimsical. And really....I just think plain white lights are so pretty. The morning of the party, Grace saw the lights for the first time. She was the only one awake at the time...and she was eating her donuts in the chair at the end of the table....then looked up at me and said, "Mommy...thank you so much for letting me have a Frozen party." Those thankyous that are unsolicited speak volumes from a 4 year old, let me tell ya. 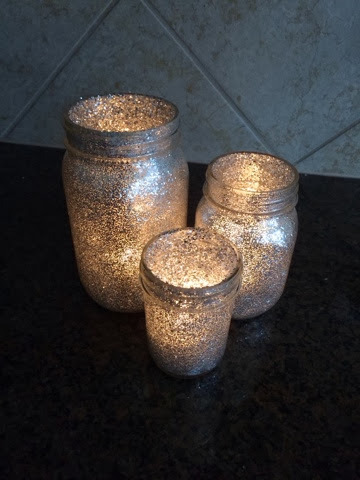 I also made these glittered mason jars and put tea lights in them. I used some old jars we've used for pickling and the lids had become rusted.....then I used a few baby food jars, too. I just had these in a few places to add a little touch. They are SO easy....glue+little water to dilute....then spread with sponge brush...then sprinkle glitter, roll around, and allow to dry. Idea for these jars from here. 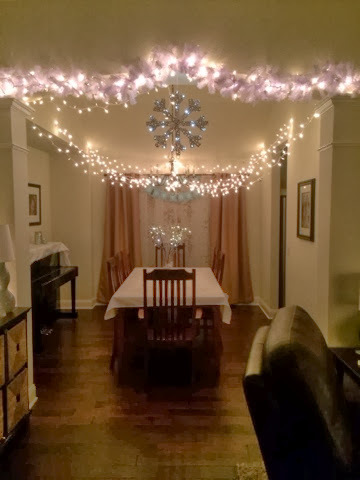 I ordered these snowflakes from Oriental Trading, printed out pictures of Grace (newborn, 9mo, 18mo, and 2yrs....I had wanted 5 snowflakes, but the set only had 4), and strung them on this silver ribbon and hung on the mantel. These are actually for centerpieces, but I used them like this instead. I decorated this table using a strand of white lights folded in half, then tied white/ivory cotton and linen and burlap strips around it. I have lots of extra strips left because I was overambitious and wanted to make a few of these fabric light strands, and it didn't happen. But again....will save to make next Christmas because I'll be using this again! It's really very pretty at night, but I didn't get a picture. I got this paper mache number 4 from Hobby Lobby when they were 30% off (normally $2.49, I think) and used lots and lots of glue and glitter. I just wanted a little something showing she was 4 and then framed this picture of her that was taken recently. Since it's paper mache and the number is top heavy....it wouldn't stand up by itself...so Geoff had the idea to cut a slit in the back and fill with quarters. And it worked! I filled some apothecary jars I had with some of the ornaments from the tree after we took the tree down....just to be a little more festive. I made all of these printables using Photoshop and digital kits I purchased from Etsy.... then printed here at home. Digital kits found here and here and here. Love her faces while singing Happy Birthday. And she blew out all of her candles! Another fun thing we did was a photo booth. I am so bad about getting pictures of everyone who comes....and this was fun....and it also took the pressure and stress off of me from trying to remember to get everyone's picture! It seems to be all the rage at parties these days, apparently. Haha! So I made everyone participate. It didn't take long and was kind of fun. For the backdrop....Geoff used 3M hooks and strung up icicle lights that we purchased on clearance after Christmas. 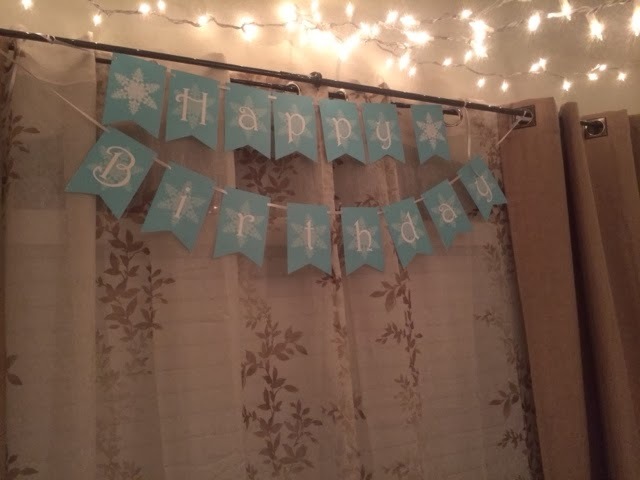 I wanted it to have a softer look, so we hung up some white tulle (about 2 yards) over it (tulle is also pretty inexpensive....$1.29/yard and used a 40% off coupon at Hobby Lobby). 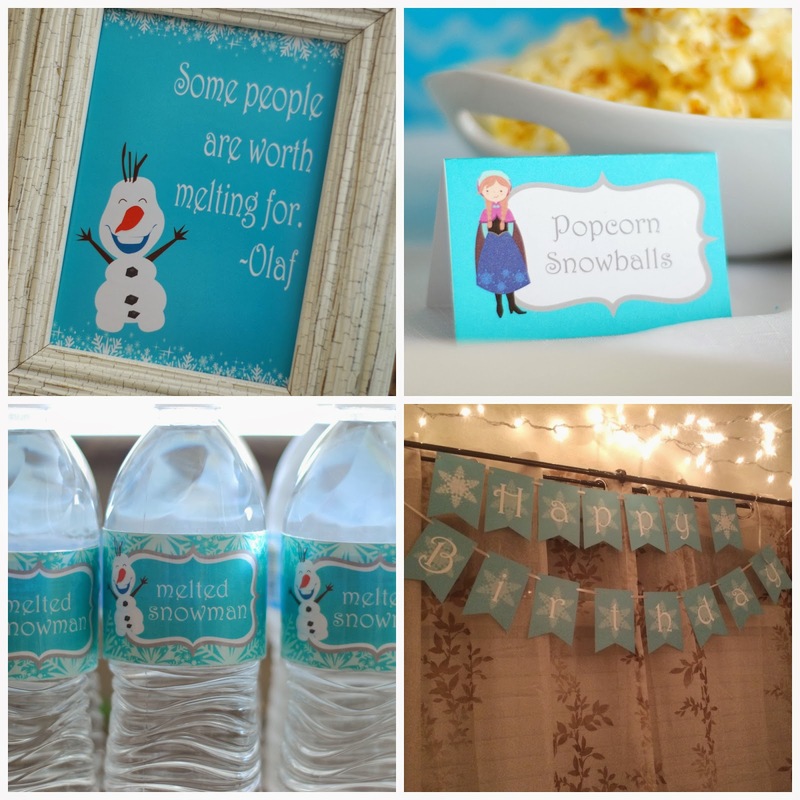 For the photo props....I used some winter themed printables from here. Snowflake ornaments from Oriental Trading, and then just found a crown template and traced and cut out of glittered card stock. We attached everything to wooden skewers. For the Elsa hair...I re-sized and cut out using the Elsa from this digital kit. For her Thank You notes....I made these. I printed on card stock, cut out, and then wrote a more personal, handwritten note on the back thanking them specifically for the gift they gave. Cutest 4th birthday party ever. I bow to your party throwing excellence. Wow!!! What an awesome party! You did an amazing job! 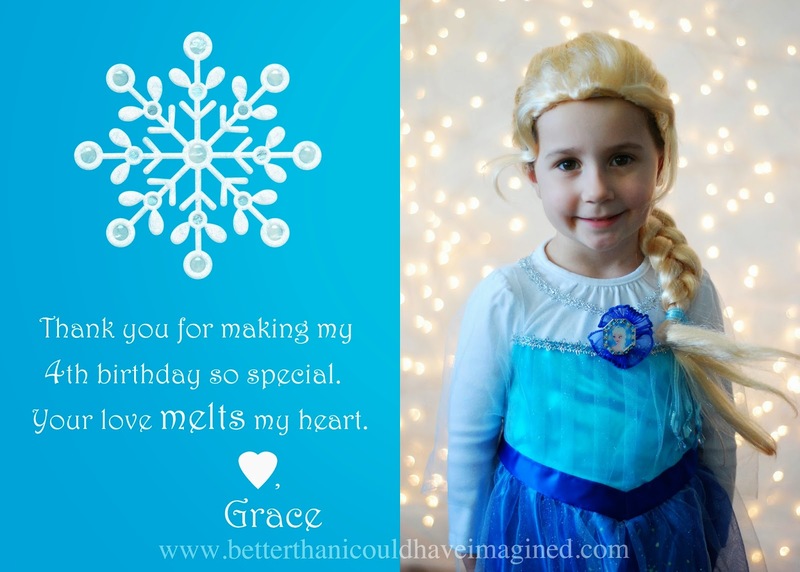 And melt my heart about Grace just taking it all in and telling you thank you for her Frozen party, so sweet!! LOVE this! 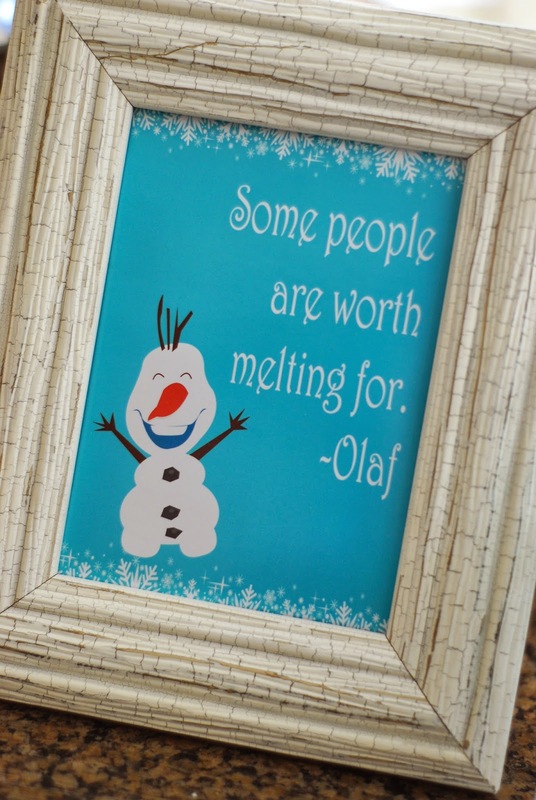 We too are having a Frozen 4th birthday party, in about a month. I might use some of your great ideas! LOVE all of this! It looks like Grace had a fabulous party! It was an awesome party for an awesome 4 year old! Fabulous party! I love it! I am planning for my birthday party of my office mate’s daughter. What do you expect? 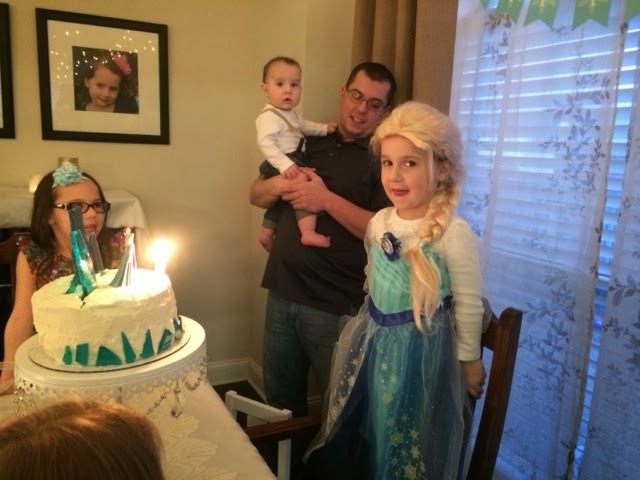 Yeah she wanted a Frozen Birthday Party so I found you blog and very thankful for these wonderful frozen birthday party ideas. If I have found this before my birthday last January, I myself would have wanted one for myself. Lol  Anyway, please allow me to include this in my Pinterest album please? 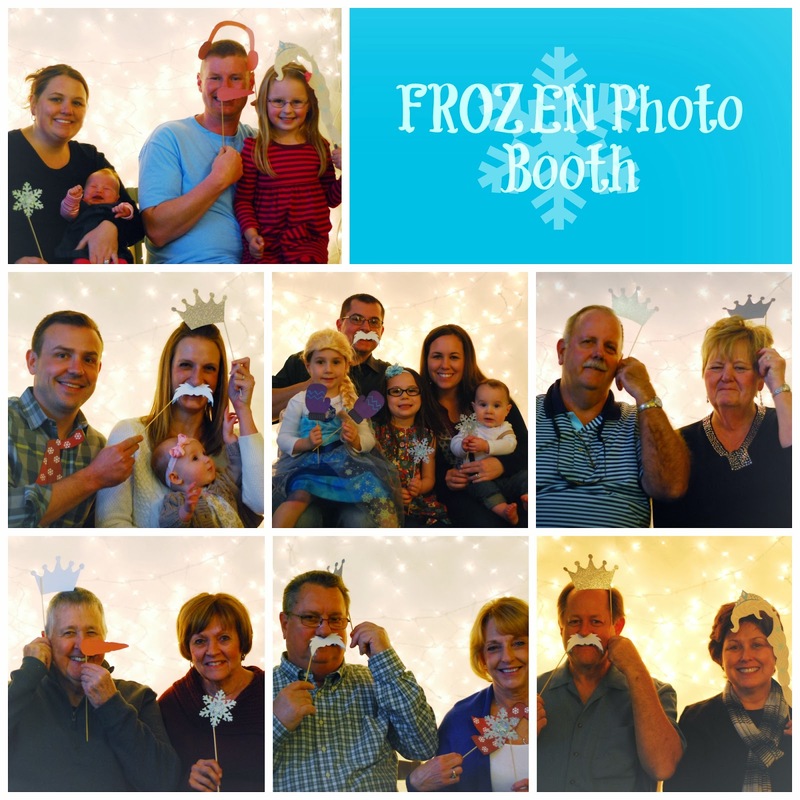 The photo booth ideas was the best! and you've got a pretty girl there. I love so many of these ideas. 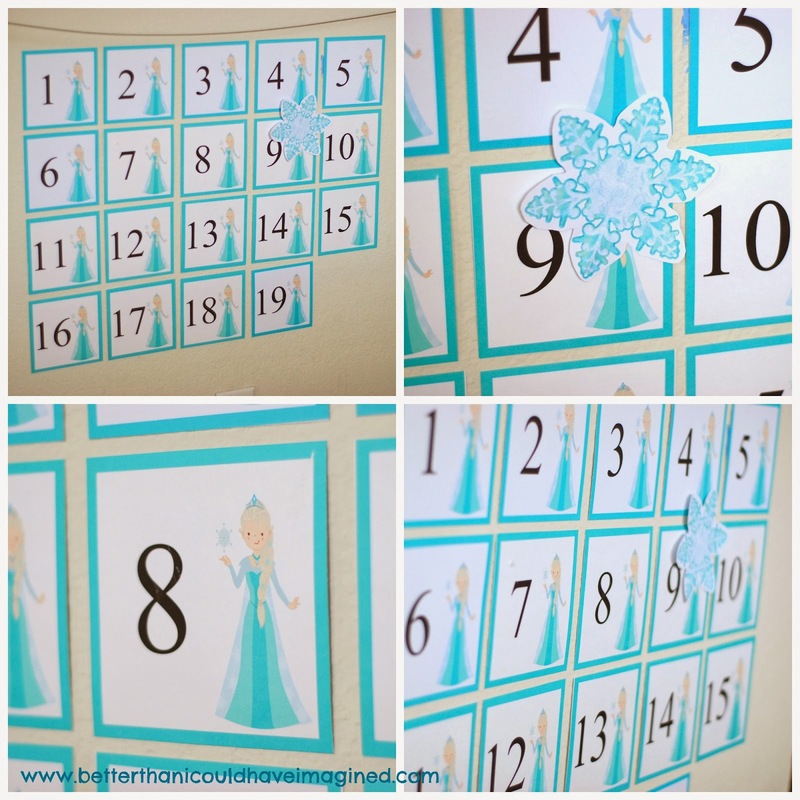 I really want to do the photos on snowflakes and either string them together like you did or put them up separately on our sliding glass door. I'm having a hard time finding the exact snowflakes you found at Oriental Trading Company. 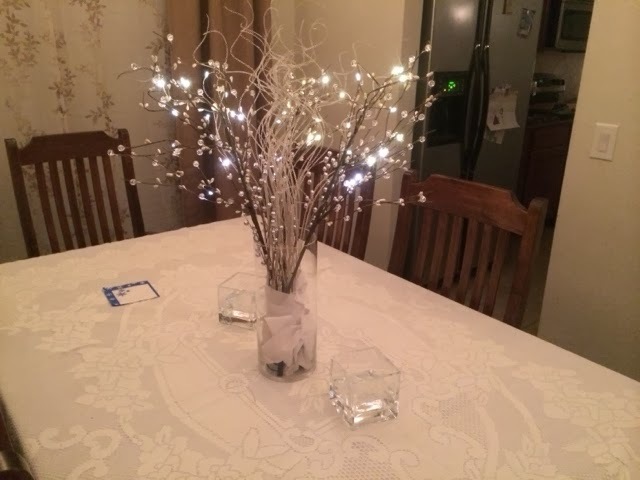 The Glitter Snowflake Centerpieces look close, but want to make sure they can be used flat. Can you let me know exactly which ones you used? Thanks! Wow!! 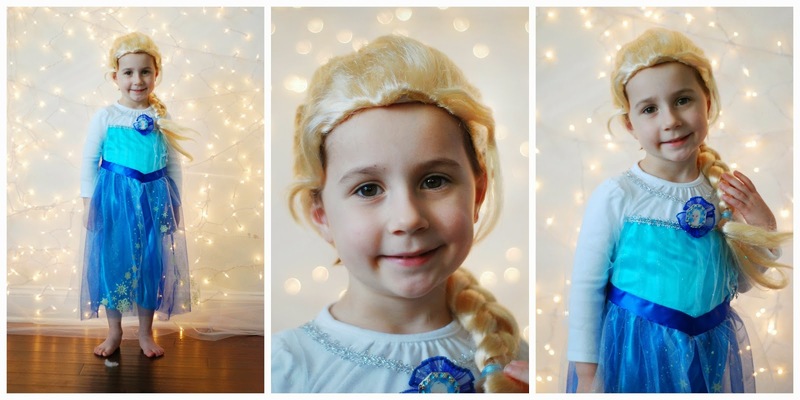 This adorable frozen party is simply superb. Must say you did a fabulous job in arranging it. 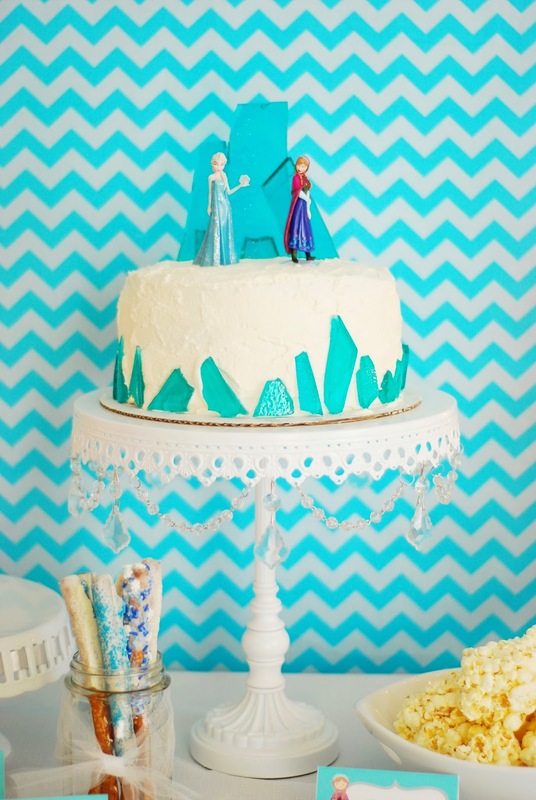 Have never arranged such themed party but would love to do for my niece’s birthday this time. Have planned to arrange it at one of San Francisco event venues. Will be implementing yours idea there.